It has long been recognised that there is an association between allergic inflammation in the upper airway (that is, allergic rhinitis) and in the lower airway (that is, allergic bronchitis or asthma). Indeed, up to 40% of patients with asthma have allergic rhinitis and vice versa.1 Both conditions have similar immunological mechanisms and underlying pathogenesis2 3 and, since one will affect the other, neither condition should be treated in isolation. Many theories have been postulated as to the link between allergic rhinitis and asthma. Given that the upper and lower airways do, after all, have the same epithelial lining, it is perhaps hardly surprising that each shows similar reactions to inhalant allergens and irritants. Another important factor is that patients with a blocked nose breathe through their mouth and consequently lose the air conditioning effect of normal nose breathing. Mouth breathing is normal only during speech and exercise. Asthmatic patients who mouth breathe are therefore exposing their tracheobronchial tree to cold dehumidified air which may aggravate bronchial hyperresponsiveness. The treatments for allergic rhinitis and asthma follow similar broad principles. The common allergens frequently implicated in the aetiology of asthma are equally relevant in the genesis of any associated allergic rhinitis. The advantage of measures such as allergen avoidance and specific immunotherapy are that each intervention may be effective for both asthma and rhinitis on a long term basis.15-17However, in the UK and Europe topical corticosteroids usually form the mainstay of treatment for both conditions.18 19 Given that many patients will be taking both an inhaled and an intranasal topical corticosteroid, a coordinated approach to the treatment of both conditions is necessary to ensure that the risk of corticosteroid related side effects is minimised. In patients with atopic airway inflammation, systemic histamine receptor antagonists are also beneficial for both conditions, but usually more for the rhinitis.20 21 When treating rhinitis alone, intranasal antihistamines such as azelastine offer a safe and effective alternative to the systemic route, and are beneficial for the symptoms of rhinorrhoea and sneezing rather than blockage.22Antihistamines have the advantage of a much faster speed of onset than corticosteroids and are often used as first line treatment on an as required basis for less severe cases of allergic rhinitis, especially of the seasonal type. Two separate multicentre clinical trials have shown clinical superiority of montelukast combined with loratadine over montelukast alone in patients with asthma or allergic rhinitis.26 27In contrast, a single centre study in seasonal allergic rhinitis showed no benefit of adding montelukast to cetirizine on objective and subjective measures over four weeks.28 In a study of patients with concomitant asthma and seasonal allergic rhinitis, treatment with montelukast 10 mg plus cetirizine 10 mg once daily was found to be equally as effective as orally inhaled budesonide Turbuhaler 400 μg once daily plus intranasal aqueous budesonide 200 μg once daily, in terms of objective and subjective markers of upper and lower airway disease.29 30 In patients with seasonal allergic rhinitis alone, montelukast 10 mg plus cetirizine 10 mg once daily was found to have comparable efficacy to intranasal aqueous mometasone 200 μg once daily.31 Further long term studies in perennial allergic rhinitis looking more specifically at upper and lower airway inflammation from mucosal biopsy specimens are required to compare the effects of topical corticosteroid therapy and combined mediator blockade. Another intriguing possibility is that the use of such combined mediator blockade in patients with more severe asthma and allergic rhinitis might facilitate the use of lower maintenance doses of topical corticosteroid, thus optimising the therapeutic ratio and avoiding the potential for systemic adverse effects in susceptible patients. Most chest physicians would probably ask briefly about allergic rhinitis symptoms in patients presenting with asthma and would possibly consider adding in an intranasal corticosteroid to orally inhaled corticosteroid therapy. Some might even go as far as to perform anterior rhinoscopy using a simple light source or possibly an auriscope. Using anterior rhinoscopy it is possible to pick up gross anterior nasal abnormalities such as enlarged inferior turbinates, septal deviation, or large polyps. The use of anterior rhinoscopy, together with a detailed history and skin prick testing to common allergens (house dust mite, grass pollen, dog and cat) will, in many cases, be sufficient for appropriate diagnosis and management of allergic rhinitis in patients presenting with asthma. However, anterior rhinoscopy alone will often fail to detect sinusitis, small nasal polyps, and other abnormalities affecting the posterior nasal airway such as septal spurs and concha bullosa (pneumatised middle turbinate). Because of the poor sensitivity of plain sinus radiographs in detecting sinusitis, most otorhinolaryngologists have adopted rigid nasendoscopy as their preferred assessment of the nasal airway and sinus openings, and as the first line investigation for rhinosinusitis. Nasendoscopy is usually performed in the outpatient clinic under topical local anaesthesia (lignocaine 5% with phenylephrine 0.5%) using a rigid 2.7 mm or 3.0 mm Hopkins rod lens telescope. With limited training, nasendoscopy is well within the future capability of a sufficiently motivated “total airway” respiratory physician. In the meantime, the establishment of a one stop combined airway clinic is the logical next progression of this concept. Here patients are seen by both an otorhinolaryngologist and a chest physician. The idea behind the one stop clinic is that patients get a thorough evaluation of their entire airway as well as facilitating joint consultation from a medical and surgical perspective. It also helps the surgeon with rapid assessment of patients who have uncontrolled asthma, particularly for preoperative assessment. In our combined clinic the basic evaluation includes (a) spirometry and flow volume loop, (b) the assessment of oral inhaler and nasal spray technique, (c) nasal symptom score, (d) peak nasal inspiratory flow before and after a vasoconstrictor, (e) skin prick testing to common allergens, (f) clinical assessment including chest examination, ENT examination, and nasendoscopy. A further more detailed menu of tests is available where indicated including rhinomanometry, acoustic rhinometry, naso-oral FIV1 ratio, and nasal and bronchial challenge tests. In experienced hands, a full rigid nasendoscopy examination takes approximately 2–3 minutes and provides important information on the patency of the nasal airway, extent of associated polyp disease and, in particular, requirements for surgical intervention (figs1-4). Other diseases with pulmonary involvement such as sarcoidosis, Wegener's granulomatosis, or Churg-Strauss syndrome may also present with lesions which are readily detected by nasendoscopy and endoscopic guided biopsy. In our practice the routine use of nasendoscopy in patients with nasal symptoms and asthma has become an integral part of the routine clinical examination of patients presenting with asthma and associated rhinitis. It allows rapid evaluation of the extent of nasal and sinus disease and the requirement for early surgical intervention. Rigid nasendoscopy also permits evaluation of the nasopharynx—for example, to look at any adenoidal hypertrophy, postnasal drip, as well as the eustachian tube orifices. 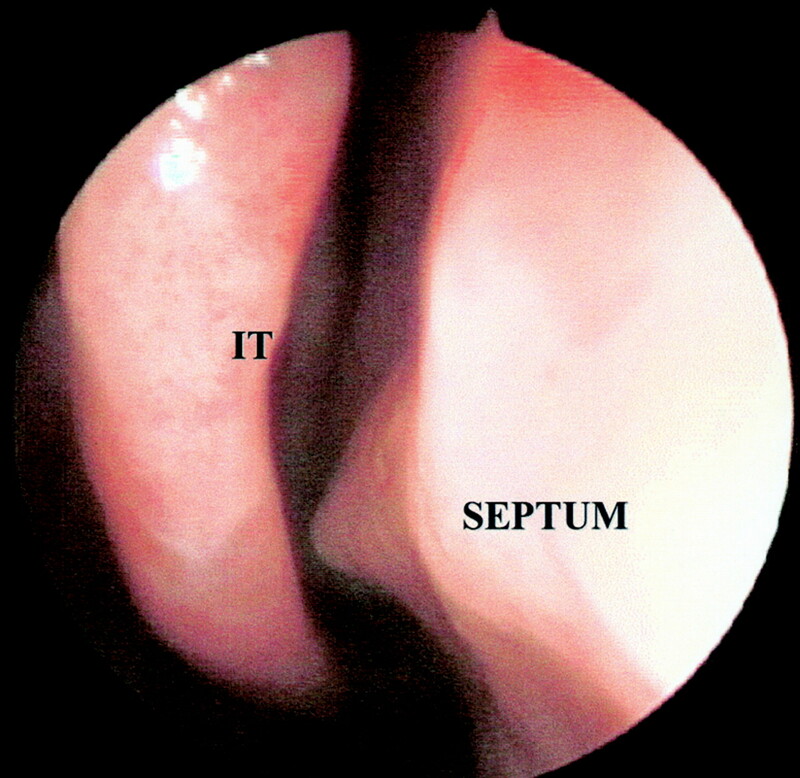 Furthermore, with a narrow channel flexible fibreoptic nasolaryngoscope it is also possible to inspect the larynx, which may be of value for patients who have associated hoarseness whilst taking inhaled corticosteroids and in patients with cough due to postnasal drip, although more detailed examination below the vocal cords requires a full bronchoscopy. Anterior rhinoscopy at orifice of right nostril showing complete occlusion by severe polyp disease in a patient with aspirin intolerance and associated late onset asthma. Anterior rhinoscopy of right nostril showing septal deviation with associated septal spur abutting onto the inferior turbinate (IT). The patient also had concomitant perennial allergic rhinitis. Posterior rhinoscopy of left nostril showing inside a normal middle meatus bounded medially by middle turbinate (MT) and laterally by uncinate process (UP). Within the middle meatus the anterior ethmoidal bulla (EB) can be visualised. Posterior rhinoscopy of left nostril showing polyp 1 in the middle meatus, bounded medially by middle turbinate (MT) and laterally by uncinate process (UP). Polyp 2 can be seen medial to the middle turbinate in the sphenoethmoidal recess. These polyps were not visible with anterior rhinoscopy. 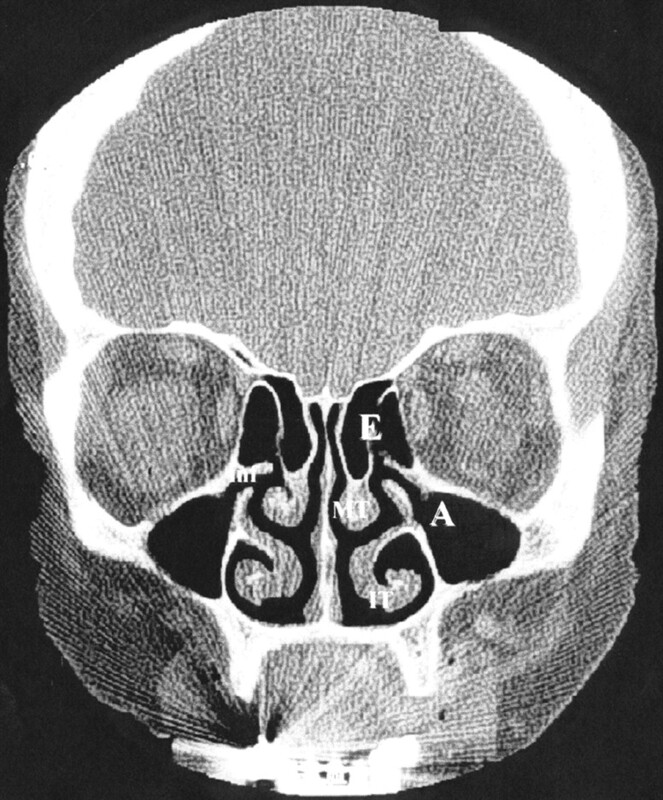 Coronal CT scan in a normal subject showing aerated maxillary antrum (A) and anterior ethmoidal air cells (E). On the right side drainage of the osteomeatal complex from the maxillary antrum and ethmoidal air cells via the infundibulum (inf) into the middle meatus is depicted. Also shown are inferior and middle turbinates (IT, MT). The inferior aspect of the infundibulum is bounded by the uncinate process. 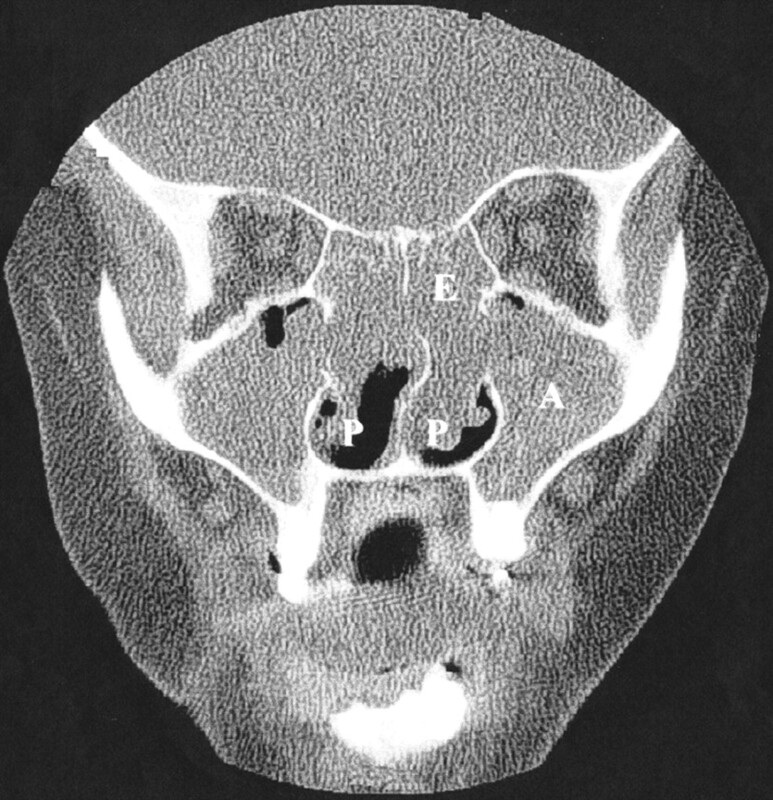 Coronal CT scan in a patient with pansinusitis and almost complete opacification of the maxillary antrum (A) and posterior ethmoidal air cells (E). 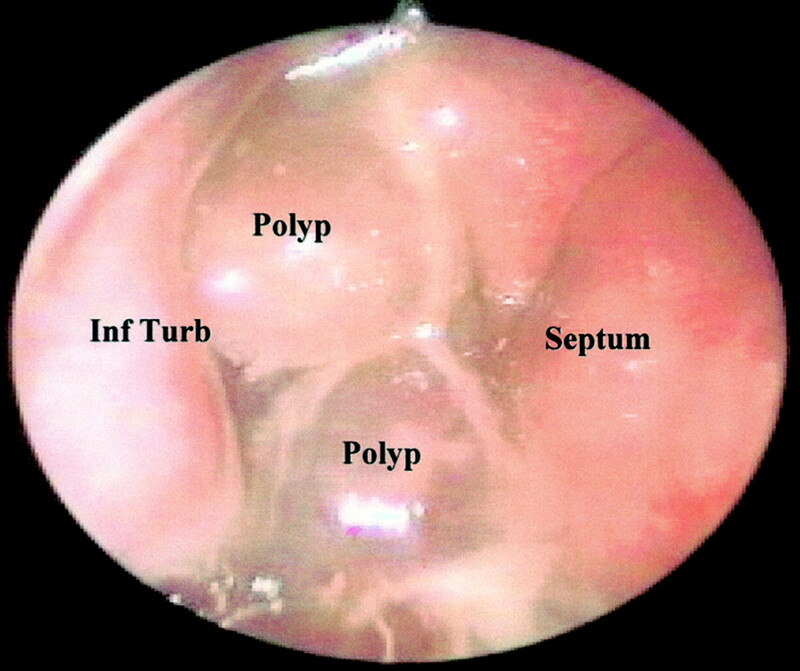 Extensive polyp formation (P) can also be seen on both sides in the nasal cavity. The use of appropriate surgical intervention in nasal and sinus disease should be considered as being complementary to medical treatment. For example, cautery or reduction surgery for inferior turbinate hypertrophy and septoplasty for septal deviation may be of value in allowing adequate delivery of intranasal corticosteroid or antihistamine sprays for associated perennial allergic rhinitis. Functional endoscopic sinus surgery for sinusitis and polyps involves polypectomy, middle meatal antrostomy, ethmoidectomy, and sphenoidectomy—depending on the extent of sinus involvement. Opening up of the sinus cavities with surgery together with polyp removal may allow better access of topical corticosteroid with sprays or drops and so prevent disease relapse. It is hoped that this review article will provide a stimulus for chest physicians to get together with their local otorhinolaryngologists to form combined one stop clinics in order to improve patient diagnosis and management. 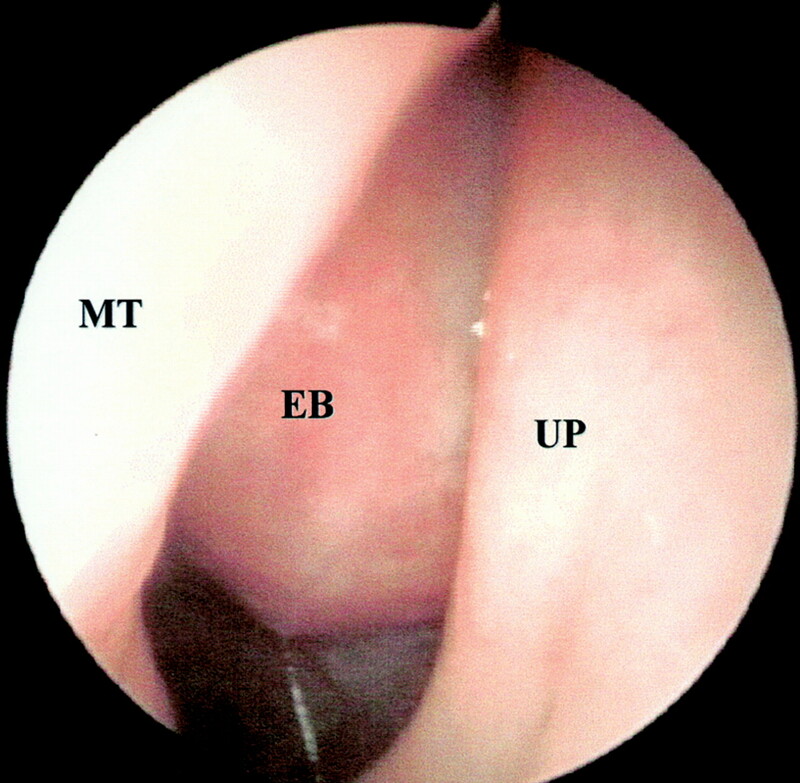 As all chest physicians are familiar with flexible fibreoptic bronchoscopy via the nose, it should not be difficult to learn the techniques required for either rigid or flexible nasendoscopy under the initial supervision of an otorhinolaryngologist. Most centres will already have a light source and camera available for bronchoscopy, so only a rigid endoscope will be required at an additional cost of approximately £2500. With government initiatives for promoting integrated one stop health service provision, it is hoped that central funding may become available to increase the availability of this technique, either in stand alone chest clinics or preferably in a combined one stop service with an otorhinolaryngologist. (1997) Allergic rhinitis and asthma: how important is the link? J Allergy Clin Immunol 99:S781–S786, . (1999) Comparison between nasal and bronchial inflammation in asthmatic and control subjects. Am J Respir Crit Care Med 159:588–595, . (1999) Immunobiology of asthma and rhinitis: pathogenic factors and therapeutic options. Am J Respir Crit Care Med 160:1778–1787, . (1996) Epidemiology of nasal polyps. Allergy Asthma Proc 17:231–236, . (1999) Demonstration of bronchial eosinophil activity in seasonal allergic rhinitis by induced plasma exudation combined with induced sputum. Thorax 54:33–36, . (1999) Eosinophils mast cells and basophils in induced sputum from patients with seasonal allergic rhinitis and perennial asthma: relationship to methacholine responsiveness. J Allergy Clin Immunol 100:58–64, . (1999) Exhaled and nasal NO levels in allergic rhinitis: relation to sensitisation, pollen season and bronchial hyperresponsiveness. Eur Respir J 13:301–306, . (1999) Eosinophilic airway inflammation in nasal polyposis. J Allergy Clin Immunol 104:85–92, . (1988) Effects of topical nasal treatment on asthma symptoms. J Allergy Clin Immunol 81:1042–1047, . (1984) Effect of intranasal administered corticosteroid (budesonide) on nasal obstruction, mouth breathing and asthma. Am Rev Respir Dis 130:1014–1018, . (1996) Once daily intranasal fluticasone propionate 200 μg reduces nasal symptoms and inflammation but also attenuates the increase in bronchial responsiveness during the pollen season in allergic rhinitis. J Allergy Clin Immunol 98:274–282, . (1992) Nasal beclomethasone prevents the seasonal increase in bronchial responsiveness in patients with allergic rhinitis and asthma. J Allergy Clin Immunol 90:250–256, . (1995) The effects of intranasal steroids on nasal and pulmonary responses to cat exposure. Am J Respir Crit Care Med 151:315–320, . (1992) Different effects of nasal and bronchial glucocorticoid administration on bronchial hyperresponsiveness in patients with allergic rhinitis. Am Rev Respir Dis 146:122–126, . (1999) Long term clinic efficacy of grass pollen immunotherapy. N Engl J Med 341:468–475, . (2000) The consideration of immunotherapy in the treatment of allergic asthma. J Allergy Clin Immunol 105:559–574, . (1998) Avoiding exposure to indoor allergens. BMJ 316:1075–1078, . (2000) Consensus statement of the treatment of allergic rhinitis. European Academy of Allergology and Clinical Immunology. Allergy 55:116–134, . (1997) The British guidelines in asthma management: 1995 review and position statement. Thorax 52:S1–21, . et al. (1999) Is antihistamine (H1-receptor antagonists) therapy useful in clinical asthma? Clin Exp Allergy 29 (Suppl 3) 98–104, . (1999) Double blind, placebo controlled study comparing the efficacy and safety of fexofenadine hydrochloride (120 ng and 180 ng once daily) and cetirizine in seasonal rhinitis. J Allergy Clin Immunol 104:927–933, . (1998) Intranasal azelastine—a review of its efficacy in the management of allergic rhinitis. Drugs 56:91–114, . (1997) Combined antagonism of leukotrienes and histamine produces predominant inhibition of allergen induced early and late phase airway obstruction in asthmatics. Am J Respir Crit Care Med 155:1856–1863, . (1999) Randomised placebo control study comparing a leukotriene receptor antagonist and a nasal glucocorticoid in seasonal allergic rhinitis. Am J Respir Crit Care Med 159:1814–1818, . (1999) A comparison of once daily topical budesonide and oral montelukast in seasonal allergic rhinitis and asthma. Eur Respir J 14 (Suppl 30) 530S, . (2000) Concomitant montelukast and loratidine as treatment for seasonal allergic rhinitis: a randomised, placebo controlled clinical trial. J Allergy Clin Immunol 105:917–922, . (1998) Montelukast plus loratidine compared to montelukast alone provides additional benefit in the treatment of chronic asthma. Am J Respir Crit Care Med 157:A416, . (2000) Evaluation of treatment response in patients with seasonal allergic rhinitis using domiciliary nasal peak inspiratory flow. Clin Exp Allergy 30:833–838, . (2000) Anti-asthmatic effects of mediator blockade versus topical corticosteroids in allergic rhinitis and asthma. Am J Respir Crit Care Med, (in press)..
(2000) Domiciliary nasal flow is a better marker of treatment response than rhinomanometry or acoustic rhinometry in patients with allergic rhinitis and asthma. J Allergy Clin Immunol 105(Part 2):S204, . (2000) Effects of monotherapy with intranasal corticosteroid or combined oral histamine and leukotriene receptor antagonists in seasonal allergic rhinitis. Clin Exp Allergy, (in press)..
(1988) Prevalence of incidental abnormalities on computed tomographic scans of the paranasal sinuses. Arch Otolaryngol Head Neck Surg 114:856–869, . (1991) Paranasal sinus bony anatomic variations and mucosal abnormalities: CT analysis for endoscopic sinus surgery. Laryngoscope 101:56–64, . (1987) Paranasal sinuses CT imaging requirements for endoscopic sinus surgery. Radiology 163:769–775, . (1992) Preoperative CT scanning for endoscopic sinus surgery: a rational approach. Clin Otolaryngol 17:60–66, . (1996) Analysis of CT scanning referrals for chronic rhinosinusitis. J Laryngol Otol 110:641–643, .